Many of the photographs are of the plant switching locomotives. Some locomotives are in immaculate condition, others quite dirty. Most of the photographs were taken in the 1980s and 1990s. Considering how difficult it may have been to access private plants, the photographs are well-posed. 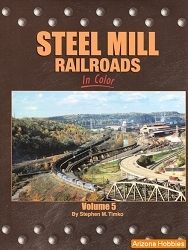 A continuing look at railroad service in and around the steel industry, including short lines, class one roads, inter-plant operations, docks, harbors, and more. Over 275 full-color photographs, including the work of several new photographers. Docks and Lake Boats, pp. 124-128. Morning Sun Books, hardcover with jacket, 128 pages, 11 x 8.5 x .5 in., Color photographs.